For a few months off and on now, we've been making a big deal of how versatile cauliflower can be. Who knew a vegetable I detested as a child could have so many tasty applications? Not me. Cauliflower has absolutely redeemed itself. Now that it's fall...can we turn our attention to butternut squash? Squash is something I hated as a kid. Don't know why, and can't recall ever really eating any growing up. I think it was one of those horrors I heard about from other kids, like not being allowed to watch The Simpsons or listen to MC Hammer, or even worse, being forced to go to dance recitals. Though I was stuck going to my older bro's marching band competitions. Blahh. Anyways, back to squash. 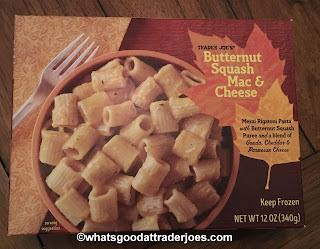 The past few autumns have featured some squashy-themed deals from our favorite grocery store (some good, some not), and this year has a new entry: Trader Joe's Butternut Squash Mac & Cheese. One word: Yummmmmmmmmmm. So much comfort going on here. Everything about this dish screams "hearty." 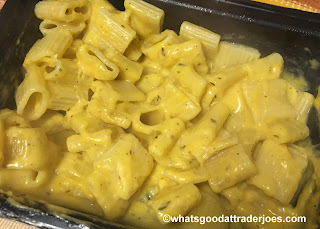 The rigatoni is big and reasonably firm for a frozen entree, and is kinda underrated, but enough about that. Let's talk that cheese sauce. It's really something else. Made with a holy trio of gouda, cheddar and parmesan cheeses, it's thick and creamy and oozes that comfort vibe. It's a hint smoky and ever so slightly sharp, and accented with some pepper and cayenne that add a small, welcome, savory kick. So good as is, I feel no need to add anything else to it. This TJ's mac is legit. Almost makes me forget there's butternut squash pureed in to the sauce. Seems to add an extra hearty, earthy oomph, but the squash is otherwise unobtrusive overall. My kids had no idea it was in there. It's $4.99 for the tray, which given the premium cheeses and whatnot involved, seems to be a reasonable value. It's easily enough for two folks in there. And all it takes is a few minutes in the microwave or oven, and a good stir to get that tasty sauce out everywhere. Convenient and comfy, this may be a fall freezer staple. Make room, cauliflower - you got some company. Wow,this sounds delicious! That said, I have a question. 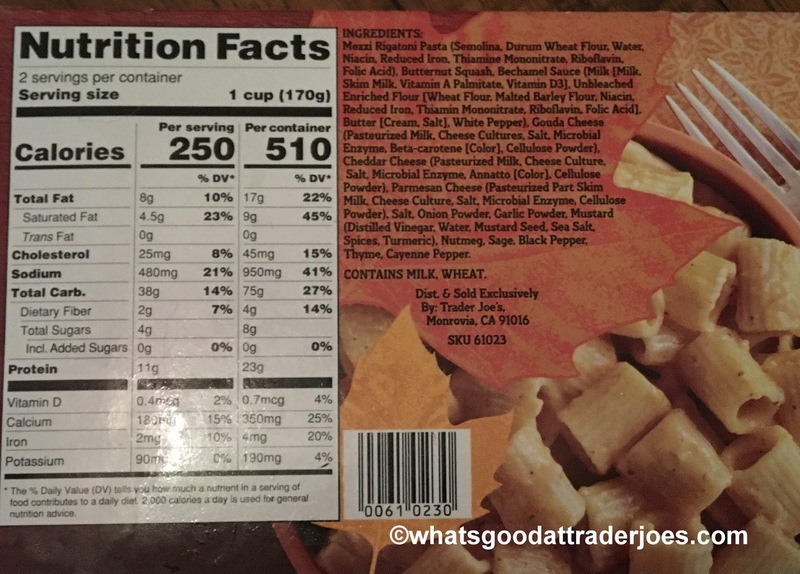 How prominent is the butternut squash? I am just not a fan of squash at all. Aside from the name I have just never found the texture appealing. Do you think a non-squash lover would like this? I would imagine all the yummy cheeses would overpower any squashy taste/texture (or maybe that's my hope LOL). Huh, wish I had gotten one of these to try them. 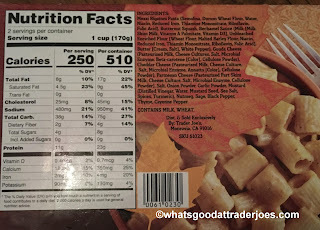 I saw the box, went "eww squash", and moved on. My TJs in NYC does not appear to carry this! How can this be? I check every time I go in. I would have thought all stores were the same. Sigh. halcyon, I'm also in NYC- they are just constantly sold out. I know this is a bit late, but they DO have it at the one on 6th ave, I got it there the other day. Now that it's not fall, they should have it more now! I tried forever to find it and was always told it just sold out constantly.